336 pages | 17 B/W Illus. Family business is the most prominent form of business organization, and its importance to the global economy cannot be under-estimated. Until recently, the impact of the family on entrepreneurial firms has been under-researched, leading to a conceptual gap between the two areas of study, and an underestimation of the contribution of family systems to entrepreneurial success. Starting from the consideration that family is an intimate and essential aspect of entrepreneurship, this book considers connections between family, family members, entrepreneurial behavior, family business, society and the economy. Bringing together a unique range of international contributions, it offers new theoretical perspectives and empirical insights as well as an in-depth consideration of the diversity of contexts and processes associated with entrepreneurship in family settings. Above all, this book opens up a comprehensive research agenda on the linkages between family, family firms and entrepreneurship and will be of interest to researchers, educators and advanced students of entrepreneurship, small firms and family business. 'Some of the most interesting insights in this book involve the new analytical levels introduced, especially those related to the family, individuals, and the context. 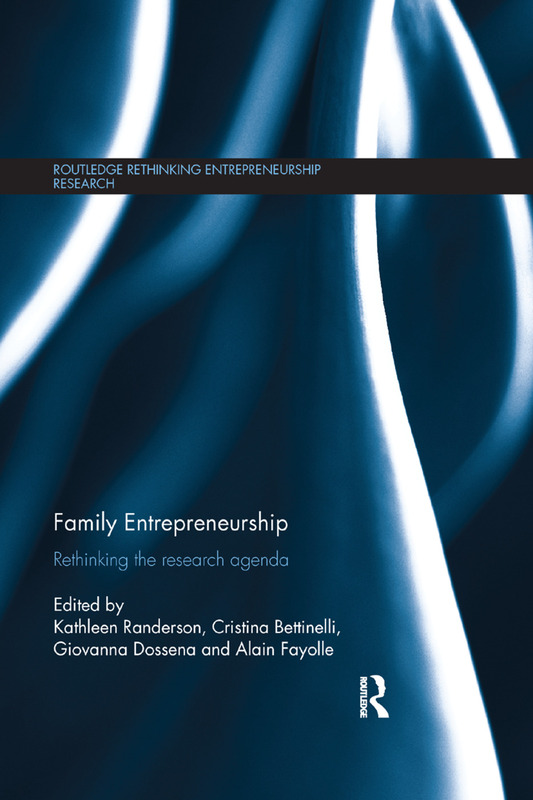 Altogether, the book undoubtedly takes a significant step toward more comprehensive research on family entrepreneurship, laying foundations for a range of research settings on this topic. I would highly recommend this book to academics… The book will be extremely useful for both PhD students and scholars at a later stage in their career, if they are planning to study family firms from a more entrepreneurial perspective.' - Tanja Leppäaho, University of Jyväskylä, Finland. Cristina Bettinelli is Assistant Professor at the University of Bergamo, Italy, where she teaches general management, entrepreneurship and international business. She is a member of the Editorial Review Board of Family Business Review, a researcher at the ELab research Center, The University of Bergamo, Italy and research fellow at the Cambridge Institute for Family Enterprise, Cambridge, USA. Giovanna Dossena is Full Professor of Entrepreneurship and Management at the University of Bergamo, Italy. She is the Director of ELab - Center for Research on Entrepreneurship and a member of the Kilometro Rosso Science & Technology Park's advisory board and is actively engaged with projects that aim at fostering the dialogue among the Higher Education System and the Business World. Alain Fayolle is Professor of Entrepreneurship and the Founder and Director of the Entrepreneurship Research Centre at EM Lyon Business School, France.